So the Tour de France is hotting up. The Isle of Man has failed to become a major wine producing region and whilst I’m happy to keep toasting Cavendish with beer from his home island, I can’t write up every bottle. Cancellara is in yellow, but I only have one Swiss wine in the house and that has more of a novelty than taste appeal. Astana won the Team Time Trial today in quite some style, but again I have failed to stock up on wines from Khasakistan (but if you know where I can get some let me know). 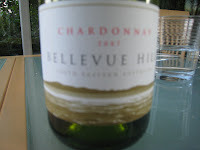 I settled instead for an Australian wine, Bellevue Hill Chardonnay from Majestic. I don’t think I’ll be needing to save a bottle for the Champs Elysses. It was a good value example of a full on Australian wine, lots of peachy-melon fruit sitting comfortably under a warm layer of butter toffee. This wine isn’t hugely complex or sophisticated, but it tastes good and it’s easy to drink.